Testing the FSMA Ag water continuum. This study took place at the peak of one of the greatest droughts in California history with record high temperatures and record low precipitation. Irrigation water supplies, always in great demand, were of limited availability and potentially of reduced quality. 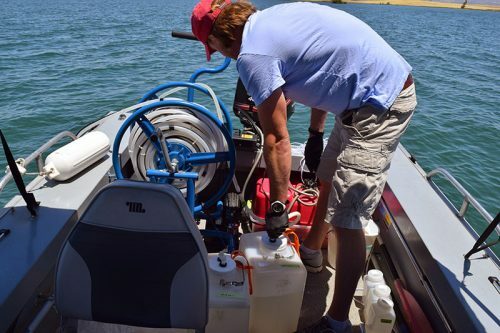 As there had been no previous microbiological food safety assessments within the California reservoir system, there was growing concern by the agricultural community that water diverted from publicly accessible impoundments imposed additional risk to downstream irrigation water supplies. Bearing these concerns in mind, we sought to understand the variability of FIB and pathogens in a subset of reservoirs in the CV during the peak of the irrigation season, July through October. Specifically, we wanted to examine whether microbiological water quality of irrigation water supplies diverted from reservoir discharge was related to the water quality within the reservoirs and whether reservoir water quality varied by geographical position across horizontal and vertical profiles. Partyka, M.L., Bond, R.F., Chase, J.A. and Atwill, E.R. (2018) Spatial and temporal variability of bacterial indicators and pathogens in six California reservoirs during extreme drought. Water Research 129, 436-446.